After years of nomadic or semi-nomadic living, we now are settled in Spain, a country that loves its coffee. We are finally investing in proper kitchen appliances and that includes figuring out the best way to brew coffee at home. In this post, we share our tips on how to choose the best coffee maker with grinder. Why Purchase A Coffee Maker Grinder Combo? In this post, we share our tips on what to consider when purchasing a coffee maker that grinds beans as well as recommendations for the best ones to purchase. If you are short on time, please feel free to use the handy table below to see our recommendations. I include full reviews of each of these products further down. We generally recommend Amazon for purchasing kitchenware for a variety of reasons. One, because many of these items are available around the globe (more or less) through Amazon. Also, if you have Amazon Prime, many times our readers can get free and speedy delivery for many of these products. We love living in Spain and traveling in Europe. I love the cafe culture and we are always seeking coffee spots to try when traveling. One thing, though, whether we are drinking coffee in Lisbon or Barcelona or Bologna we miss big American cups of coffee! I love espressos and macchiatos, but at home, I want a full-sized cup for coffee in the morning. When we first moved to Spain we used a stove-top Italian coffee maker, which I still love. But after a while we wanted an American coffee maker brand, to make a full pot of coffee. We also started grinding our own beans. It’s almost part of the ritual. Eric prepares the coffee and I can smell the beans from the couch. When we lived in Bali we started taking our coffee-drinking more seriously. Indonesia produces some fabulous coffee beans. At the time, we visited our favorite Bali coffee shop, Anomali, several times a week for a proper coffee. And, we purchased our coffee beans, asking them to grind the beans for us. At the time, that was a big improvement for us. We did the same when we lived in Bangkok. Now, I couldn’t imagine Eric not grinding our own beans at home. It also gives us some flexibility to buy different types of beans at coffee shops we visit around the world. When we bought our first coffee grinder, I simply felt we had upped our game. There is something about the ritual of grinding your own beans, the resulting aromas, and of course the joy of the first sip. There is no going back for us. Although buying pre-ground coffee, whether from a supermarket or from a coffee roaster can be more convenient, the quality of the coffee is just not as good. A coffee maker that grinds beans will give you the benefits of freshly ground coffee at home. By grinding the beans just before brewing you are unlocking the aroma of the beans at just the right time. There are a few ways to grind your own coffee at home. A lot of people like to use a manual coffee grinder, which has some benefits. It’s certainly classic and a hand grinder doesn’t use electricity, which can heat the beans. It can, however, take a while to grind the beans, particularly if you are making three or more cups of coffee at a time. Another option is to use an electric coffee grinder. This speeds up the process and certainly saves time. But, it can take up counter space. There’s also the extra step of then moving the ground coffee to the coffee maker. Using a coffee maker with a built-in grinder, though, saves space and eliminates a step. It’s not the end of the world to place a coffee grinder and brewer side by side and use two different machines. But, there are some benefits to investing in a two-in-one, a so-called grind and brew coffee maker. 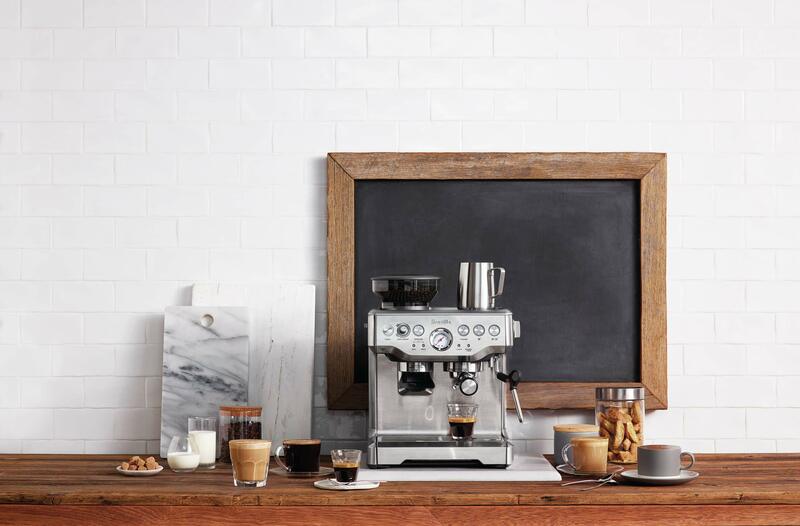 Over the years, we’ve purchased so many different coffee machine brands. If you lined them all up in one room it would probably look a lot like the coffee maker aisle at Bed, Bath, and Beyond. Over the 20+ years we’ve been together, we’ve owned a Cuisinart, Black & Decker, Kenmore, and a Krups coffee makers. At first, we cut corners and bought less expensive coffee makers. But, we found that they just didn’t get the job done. Even the first coffee maker we bought in Spain was cheap. But, we got what we paid for. One morning a spring mysteriously fell off and coffee sprayed all over the kitchen. We learned our lesson. If you drink coffee every day and expect it to give a jolt of energy to help get you through your day, it makes sense to invest in a quality machine. To me, it’s like investing in a few good kitchen knives, which can make a world of difference when cooking at home. When it comes to buying a good quality coffee grinder and brewer combination, it’s worth it to invest a little extra for an appliance you use every single day. A traditional coffee maker is one that brews coffee using pre-ground coffee. Coffee makers with a grinder, grind the coffee beans just before brewing. Whereas pre-ground coffee loses its freshness, aroma, and flavor, automating the process ensures all of that flavor goes right into the cup. If you have two appliances, a coffee maker and a separate grinder (either electric or manual) you take up more counter space, have to maintain two appliances, and waste time. A built-in grinder is faster, more compact, and more convenient. Having one appliance instead of two can also save money in the long run. A proper coffee maker with grinder will allow you to select the quality of the grind, meaning you can choose how fine or how coarse the grinds will be. You can blend your own coffee before brewing. For example, you can mix half decaf beans to reduce the strength if needed. Some coffee aficionados might not want an all-in-one coffee maker because they prefer to be more hands-on in their coffee making. There’s nothing to say that you can’t have multiple ways to make coffee at one time. We have three options even in our small Spanish kitchen. But an automatic coffee machine with grinder can produce quality coffee while also being convenient. In today’s day and age with increasing demands of our time, sometimes this is the best reason to do anything. Just don’t sacrifice flavor for convenience when shopping for the best automatic coffee maker with grinder. Always brew with freshly ground beans – a fresh grind means fab coffee! Having an all-in-one coffee machine is convenient. Add beans, add water, drink coffee – super easy! We’ve done a lot of researching into different types of drip coffee makers with grinder in order to help you make the right decision. The most important thing to remember is to not only think about price. It is rare that the cheapest appliance is the best and it is also not necessary to always buy the most expensive appliance in order to have a quality machine. In this section, we will walk through what to think about when choosing the best grind and brew coffee maker that suits your needs. There are two main ways that coffee beans are ground inside the machine. Less expensive grinders use blade grinders, which work similarly to a fan. Higher quality grinders will use burr grinders, which lead to more consistent grinds of more even size. It is generally accepted that burr grinders result in more aroma, more flavor, and more consistency. In both manual coffee grinders and electric coffee grinders, it’s important to be able to adjust the grind setting. This allows for both fine and coarse grinds. When having a separate grinder, you might use the beans in a variety of brewing contraptions. When using a coffee machine with grinder you will normally only be using the beans for drip coffee. But, being able to adjust the grind setting will allow you more control over the type of beans you can use for your coffee. With any coffee maker, it’s important to estimate how many cups you need to make at one time. It’s possible to purchase a single cup coffee maker with grinder as well as a combo machine that results in 10 or more cups in a pot. When it comes to choosing the best coffee machines for home use, there are a few options when it comes to filters. Some coffee makers have a built-in filter. Some require a paper filter. This can be a matter of preference. In some machines, the factory-installed filter might not be enough. Often it is necessary to use paper almost as a backup in order to produce a more clear and clean brew. Check to see if the coffee maker allows you to brew coffee that is already ground. Sometimes this is needed, either because you ran out of beans, or perhaps you received ground coffee as a gift. At least once, we’ve just grabbed the wrong kind of coffee from the shelf. Obviously budget is an important concern, with machines costing less than $100 or over $1000. Like I said above, though, consider it as an investment and don’t just jump on the cheapest option, like we did when first moving to Spain. A big, messy mistake. There are few other issues to consider whether buying a traditional coffee maker or a coffee machine grinder combo. First, consider how much counter space you have available, as well as your cabinet clearance. Be sure to allow enough room between the bottom of your cabinet and the top of the machine to operate the machine properly. Consider whether you need a timer, and automatic turn off, or an auto-start. An auto-start function can be useful because the coffee will start brewing the moment the grinding is complete. The most convenient option is to be able to add the beans and the water the night before and have the grinding a brewing function set to a timer in order to wake up to the perfect cup of coffee. Some of the best bean to cup coffee machines also have functions to make espresso, cappuccino, or even include milk frothers. Decide on whether you want all of these functions in one magical machine. Last, check the manufacturer’s warranty to ensure what is covered. This is particularly important when investing in some of the more expensive coffee grinder and maker combos as there are a lot of moving parts. 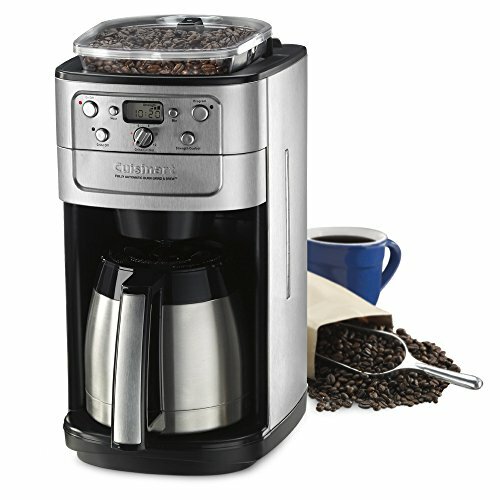 The Cuisinart coffee maker with grinder is full of features considering the price. This coffee machine is fully programmable up to 24 hours in advance. There is an auto-shutoff so you don’t leave the coffee maker on accidentally and a brew-pause feature so you don’t need to wait until the carafe fills for that first cup. The built-in automatic burr coffee grinder holds up to a half pound of beans, meaning you don’t need to fill it up for each use. The lid seals tight to avoid moisture seeping in. It includes strength control and grind control. A grind control program allows you to grind the right amount of beans for anywhere from two to 12 cups. There is also a Grind Off function allowing you to brew from pre-ground beans. Most of our recommended coffee makers include a thermal carafe, which helps to control the temperature of the coffee for an extended amount of time. The carafe holds up to 12 cups of coffee, each cup measured at five ounces. The control panel at the front is super easy to use too. Overall this is a good value for what it offers from a well-known household appliance brand. And, it just might be the best Cuisinart coffee maker available. The Capresso CoffeeTeam TS is a 10-cup coffee bean grinder and brewer that freshly grinds whole coffee beans directly into the filter. There is an option for this coffee machine to come with a glass carafe as an alternative to the thermal carafe. There is a 24-hour programming function. The bean container is only six ounces, which is slightly smaller than the Cuisinart but will produce 20 cups of coffee before needing a refill. There are five grind settings for the steel conical burrs to adjust the brew to your taste. The burrs grind slowly to minimize heat from the electric grinding. The grind settings range from two to 10 cups and range from mild, regular, or strong. You can also adjust the settings for light and dark beans, because the darker the bean, the more oily the beans are, the more coarse the grind should be. There is a Grind Off function to use pre-ground coffee. The last coffee maker we owned before leaving the US was a KRUPS. I loved it and we had it for years. KRUPS makes good coffee makers at an affordable price. 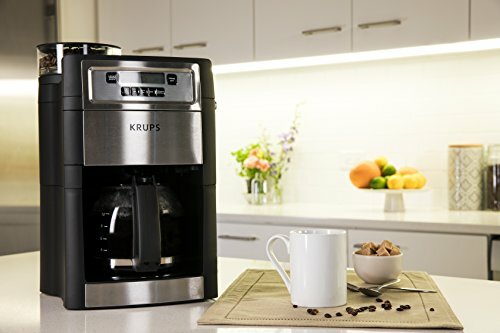 The KRUPS Grind And Brew With Automatic Burr Grinder is a 10-cup drip coffee maker. There are five settings on the conical burr grinder, allowing for the ideal grind. There is also a brew strength selector. The coffee maker has an auto-start function and a keep warm function for up to two hours. This is necessary as this coffee maker includes a glass carafe rather than a thermal carafe. 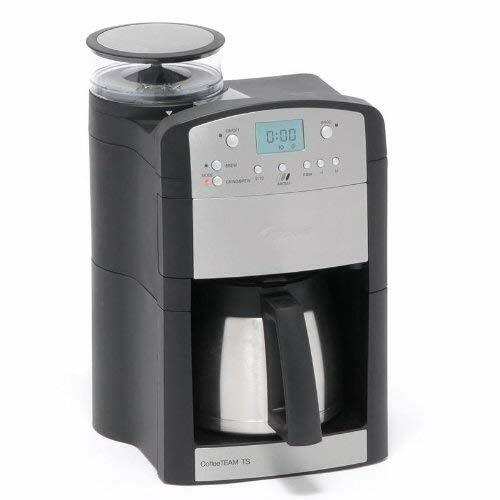 We consider this drip coffee maker with grinder as our top pick in the chart above because of the KRUPS name, our experience with the brand, and the value it gives at this price point. The next couple options I include are in the higher-end of the price ranges, and it is a huge leap from the last few coffee makers to these espresso makers. 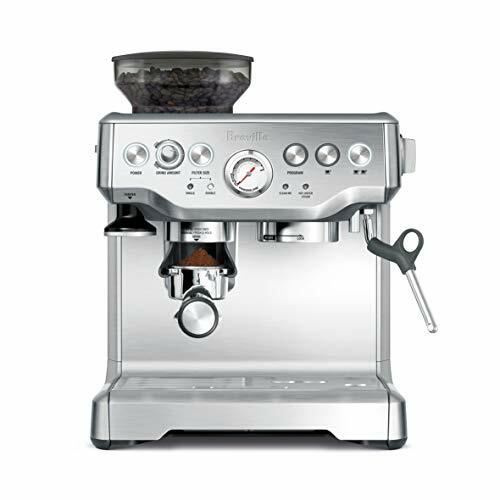 Here, we recommend a few options for an espresso machine with grinder for people who prefer to make espresso-style beverages at home. Living in Europe, this is not really for us as we get fabulous espresso at cafes throughout Spain, Italy, and even Portugal. For us, at home, we want drip coffee. But, I wanted to include some options for the best espresso machine with grinder as alternatives. I have to admit that the Breville Barista Express is an aspirational coffee maker for me. Sure, we don’t need to make espresso or cappuccino at home, but what this machine can do is pretty impressive. 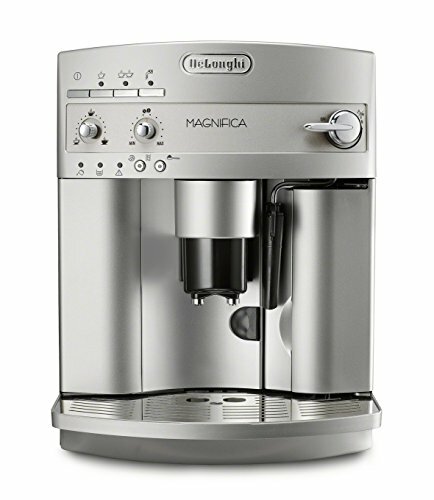 Imagine everything you want an at-home espresso machine to do and it does it, plus it is pretty stylish, coming in silver, black and silver, or red, which just reminds me of Italy. This is slightly more advanced than a bean to cup espresso machine. As for the grinding function, there is dose-control grinding to deliver the perfect amount of coffee based on your taste. There is a micro-foam milk foamer to create the perfect at-home cappuccino. The machine also includes all of the coffee-making accessories needed to operate and clean the machine for long use. 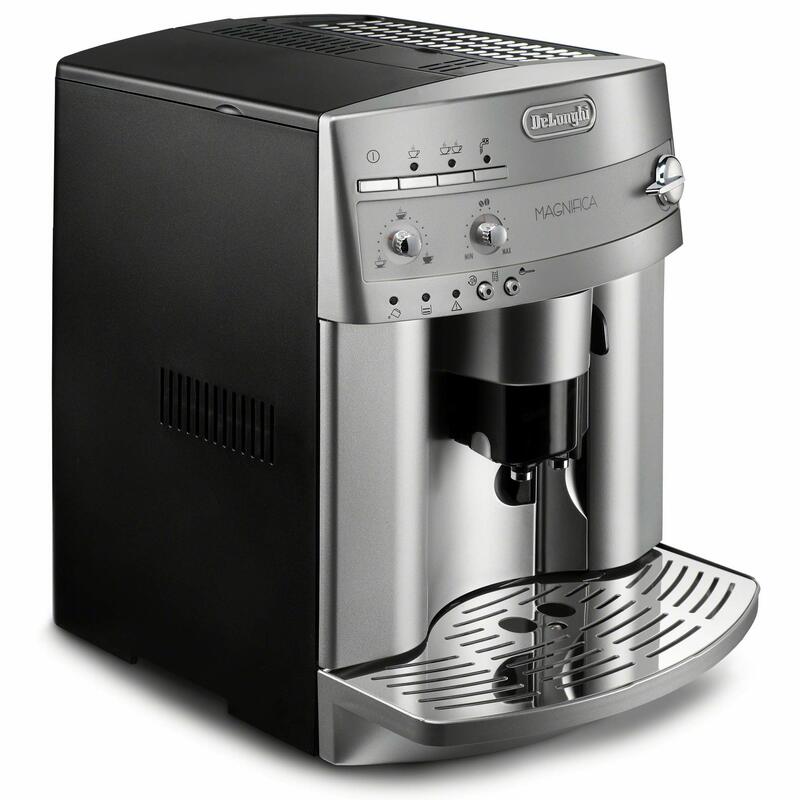 DeLonghi has a virtually untarnished reputation for quality coffee and espresso machines. Despite all of its advanced functionality, this machine is both relatively easy to use and easy to clean. The coffee bean container holds almost nine ounces of coffee beans, which is enough to make over a dozen cups of coffee. DeLonghi also prides itself on the ease of its cleaning process. And, they stand behind their product with an 800 number to help coffee aficionados set up and maintain the espresso maker. This is a great service, but one that is sort of a requirement at this level of investment.